You might know Square Enix game creator Tetsuya Nomura best for his Final Fantasy and Kingdom Hearts character designs. 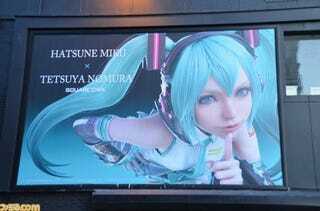 Recently, his version of virtual idol Hatsune Miku was revealed in New York. Via Sega, here is what Hatsune Miku usually looks like. And as Famitsu shows, this is Tetsuya Nomura's take, which was created for a Miku art exhibit in New York. Miku looks she would be right at home in a Final Fantasy game. Which makes sense, seeing how influential Nomura's art has been for the series. The Hatsune Miku art exhibit runs from October 9 to October 19 at Wallplay in New York City. For more on the event, check the official site.